Hard Stuff in 1972. John du Cann on right. John Du Cann, guitarist with Purple Records artists Hard Stuff aka Bullet, has died (Sept 21. 2011) of a suspected heart attack. Born in 1945, he is perhaps better known for his earlier work in prog rockers Atomic Rooster. He left the band after disagreements with Rooster’s Vincent Crane to start a new outfit. 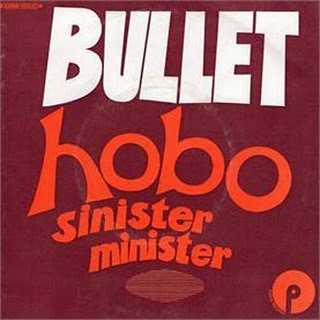 They began life as Bullet (their debut single Hobo was in fact the first single on the fledgling Purple Records), but had to change their name when they discovered it was already in use. 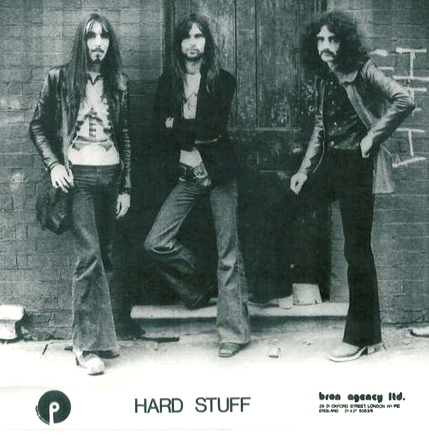 Hard Stuff’s first album Bulletproof was issued in 1972. Their second, Bolex Dementia, followed in 1973 but the band split that year, both musicians having been injured in a car crash. The two Bullet albums have been out of print for some time as the production tapes are missing. However the rights have been licensed to a UK label and so they are likely to appear before long. Damn… I just now found out about john’s death. I live in the U.S. so you can understand me not getting the news. Only last month I ordered the first 3 cds of Atomic Rooster….he made them great in my opinion. Sad to hear how his belongings were left to the highest bidder. Just thought I’d let you know that John du Cann died alone, effectively leaving his huge collection of guitars, amps and records in the hands of solicitors. So the whole lot went off to a Norfolk auction house in mid-Jan 2012 (Friday the 13th, funnily enough) and amongst the lots was his 1963 Fender Strat (£6500!) plus numerous records from his career, including quite a few on Purple Records such as Hard Stuff. Quite sad to see someone’s life laid out before your eyes, bundled into 400 lots, but quite exciting all the same. The first Hard Stuff album Bulletproof has long been one of my favourites. I love the raw roughness of it but found the follow up Bolex Dementia to be a bit of a disappointment. They are long overdue a re-release in my opinion. Planet Rock have mentioned John’s passing on their website. There is a link to his appearance on Top of the Pops in 1979 when he was performing his single “Don’t Be A Dummy”, featuring John McCoy on bass guitar. I had glossed over this strange single from his New Wave period!